Saul, whose name later changed to Paul came to the same Christians he had spent his life persecuting. “I am born again. I am now one of you.” You don’t want to go near Saul to find out if he was being sincere or not. You would wish there was a spiritometer. 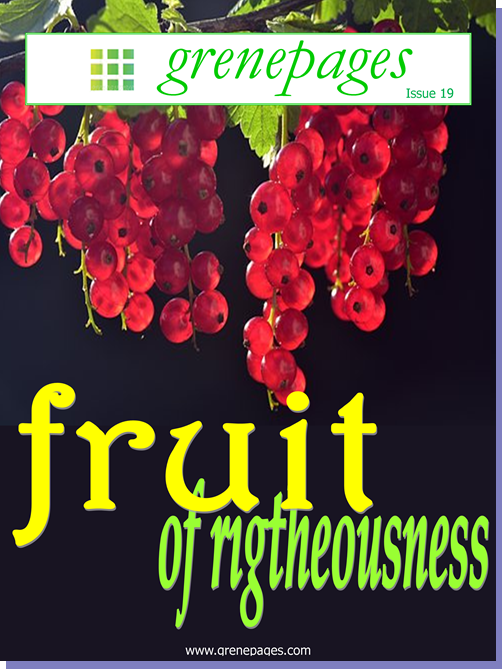 This edition of grenepages “fruits of righteousness” serves as a guide for us to check ourselves first even before any attempt to check others. Compare your fruits to what you profess. What kind of fruits am I producing? Welcome to grenepages. It’s always a pleasure to have you here. This entry was posted in grenepages and tagged editorial, issue 19. Bookmark the permalink.